Living in the Present Reality of God’s Kingdom – Connection! Our passion will be set ablaze when we view life with spiritual binoculars. Although the kingdoms of the world are powerful, they rise and fall according to God’s will (Daniel 2:31-43, 7:2-8, 8:1-26, 10:20-11:45); our passion in prayer will intensify as we focus on God’s triumphal kingdom crushing evil as it marches on into eternity (Daniel 2:44-45, 4:3, 7:9-27, 9:24-27, 12:1-3). In short, personal passion in prayer will inevitably inflame and enlarge our heart to envision the eternal reality of God’s manifest kingdom. Daniel’s passion-saturated prayers exposed wicked schemes, confirmed rescue operations, affirmed God’s administration of nations, uncovered an invisible war that rages on in the heavenly realm, and clarified God’s blessing on the repentant, humble, and broken ones. But the Daniel model does come with one warning: passion in prayer can be very intense; our thoughts may become deeply troubled by some disturbing insights from God (Daniel 7:15, 28). At times we may feel exhausted or sick (Daniel 8:27; 10:1-2, 8-10, 15-17). But what did Daniel do? He always asked the Lord to interpret everything (Daniel 7:16, 19-20; 12:8) and had enough wits about him to keep some matters to himself (Daniel 7:28). Daniel is a key model. His blameless, strategically informed humble heart was less interested in interpreting future events than it was in passionately praying in the present reality of God’s kingdom reign. Father, my heart longs to be in a place of total surrender, no matter what the consequences might be…but I am uncertain at times about the difficult requirements that may come with passionate prayer. Give me the courage to be the person You have created me to be so that, like Daniel, my heart would burn with desire to know You intimately, and to fully live within the “eternal reality” of Your present kingdom! 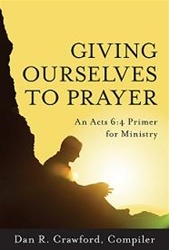 –Adapted from Giving Ourselves to Prayer: An Acts 6:4 Primer for Ministry (Chapter 22, A Biblical Role Model of Personal Passion in Prayer by Gloria J. Wiese). This book is available at prayershop.org. Use the code CONPSP3 at checkout to receive an additional 10% discount. Praise God, whose name is great among the nations (Mal. 1:11). Give thanks that the gospel has reached around the world and into your heart. Confess any sin that has hindered you from gaining a clear vision of God’s work in the world. Commit yourself to God’s plan for the gospel to be preached in the whole world (Mt. 24:14). Ask God to use you in that plan. Boldly intercede for the work of gospel missions worldwide. Pray by name for world missionaries whom your church supports. Ask God to protect them and prosper their work.